Ecublens, Switzerland: –Powder handling and containment specialists Dec Group plan to bring triple benefits for its visitors to the forthcoming Powtech 2014 Trade Fair in Nuremberg with free entry, live music and demonstrations of its latest low-cost Isocharge system. People interested in visiting Powtech 2014 can apply to Dec Group now for their free entry tickets. 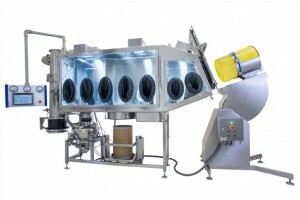 Visitors to the Dec Group stand at I-213 in Hall 1 at the Nuremberg Exhibition Center will be able to see Isocharge on display, showcasing its safe and clean bag discharge and transfer into next process step, in this case PTS (powder transfer system) with DosiValve installed on top of DCS Drum Containment System for precise drum filling. The Dec display will also feature Micronizers MC One, MC 300, a big bag filling station, a new docking system for big bag discharging applications, drum emptying (DCS Drum Containment System) and accurate dosing solutions. On the first two days of the show, September 30 and October 1, Dec will also be throwing a stand party starting at 1700 hrs, with live music and food. “We aim to play our part in making POWTECH 2014 an even bigger success than ever,” said Dec Group Marketing specialist Gabriela Mikhaiel. “We’re looking forward to meeting lots of people on our stand in Nuremberg to share our food and music,” she added. “We’ve been attending this event since the late 1980s and this year our stand will be better than ever. Once again, POWTECH should provide us with a great platform to meet our existing and potential clients and to show them how they can benefit from Dec as a one stop shop for all system solutions, to do with powder handling and process containment,” declared Ms. Mikhaiel. Dec Group is the leading global provider of powder handling systems and is recognized as a world-leading expert in process containment technologies. It has been supplying the pharmaceutical, chemical, food and cosmetic industries for more than 25 years. Headquartered near Lausanne, Switzerland, Dec Group has a global presence with subsidiaries and agents in more than 35 countries including European subsidiaries in the UK, Ireland, Germany and Poland, together with an Asian office in Mumbai, India, and a North American subsidiary, Dec USA, based in New Jersey. The POWTECH International Trade Fair for Mechanical Processing Technologies and Instrumentation bills itself as the world’s undisputed number one event for processing, analysis and handling of powder, granule and bulk solids technologies. The event is based on an exhibition supported by top-grade programme of talks, presentations and networking events. The event is organized by Nürnberg Messe, with the 2014 event again taking place at the Exhibition Center in Nuremberg from September 1 to October 2. POWTECH, shared with the TechnoPharm event, is staged every 18 months. The previous event, in April 2013, was also staged in Nuremberg and featured 724 exhibitors, attracting more than 16,800 visitors from 27 countries worldwide. Click on Dec brings triple whammy to Powtech Nuremberg event for other information.